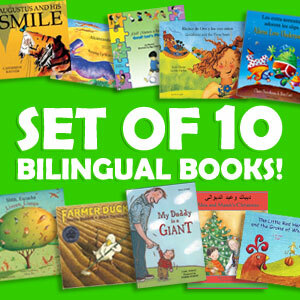 New Bilingual Book Sets – Now in 30 Languages! We have hand-selected groups of our most popular books to support language learning and promote literacy initiatives. With just one click, you can even choose between sets of five and ten. Tailored to meet the language needs of teachers and librarians, they make ordering easy and eliminate the work of searching through our site to find the perfect books for your classroom or library. These book sets will save you time and money, and help you choose the most accessible, interesting, and culturally appropriate books for the children you want to reach. Now Available in 30 Languages! Albanian, Arabic, Bengali, Bulgarian, Chinese, Czech, Farsi, French, German, Gujarati, Haitian Creole, Hindi, Italian, Japanese, Kurdish, Lithuanian, Panjabi, Polish, Portuguese, Romanian, Russian, Somali, Spanish, Tagalog, Tamil, Turkish, Urdu, Vietnamese, and Yoruba. To celebrate our 10th anniversary, we are offering $10 gift certificates for every 10-book set that you order before May 31, 2015. If you order multiple 10-book sets during this promotion, you can receive multiple gift certificates! To receive your gift certificate(s), simply order a 10-book bilingual book set by May 31, 2015, AND in the “Order Notes” section of your online order, write “10-10-10” and your email address. If you are mailing or faxing an order, simply write “10-10-10” and your email address on the cover or front page of your order.